I'll focus on preparing the next GW search, so there won't be much progress on CUDA in February. Can you tell us anything about it yet: S5R7 or S6R1? Similar to the current run, or significant differences? The data taken in S6 so far is actually noisier than what we have of S5, so we'll stick to S5 data for now. We're working on a new program that will combine a new, faster implementation of the FStat calculation with a new method called 'Global Correlation Transform' that will supersede the 'Hough Transform' used in the current HierarchicalSearch, resulting in the most sensitive search for continuous signals that we know, and still requiring much less computing power for the same parameter space. 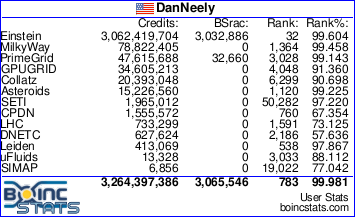 We work on turning the program into a reliable BOINC application and on setting up a search design (i.e. how to split up the parameter space into workunits), which will result in a new workunit generator and possibly new data files. With luck, we'll have that ready by the time we run out of S5R6 work. If we aren't, we'll insert a short run with the same application and data as we used on S5R5 and S5R6, but looking into higher frequencies. S5R5 went up to 1kHz, S5R6 covered 1kHz to 1.2kHz, the current data files allow to search up to 1.5kHz. Wow, that sounds fascinating! It always amazes me how much brute force processing one can avoid by improving the algorithms employed. discussion of what's to come after S5R6 has finished that started in ABP2 CUDA applications. We found that setting up a search (data, workunits) for the new code is pretty difficult given the little experience we do have with it. So most liekely we'll have a short (~2 month) "engineering run" with a code that combines the new GCT with the "traditional" FStat code, analyzing the whole S5 data (first half was used in S5R1-3, second half in S5R4-6), and looking at a parameter space that has already been covered (partly) by S5R3 and S5R5, so we can compare the results and get a better feeling for the workunit setup. With only ~10 days of S5R6 data remaining can you give us an update on where the next run stands? Not much news. The run will probably be named S5GCE (S5 data Global Correlation Engineering run) and preparation and testing is underway internally. Looks like we're well in the plan. At current processing rate S5R6 will run out of (new) work on March 18th, we should be able to run the first larger tests on the main project around the next weekend. Applications are currently x86 only. I think we will continue to suppoert Mac OS X PPC, but the Apps for this platform might be delayed by a few days. For this run we'll use the database for 'locality scheduling' communication between workunit generator and scheduler, instead of the communication files being used up to S5R6. AFAIK E@H is the only project using locality scheduling, so though being a medium change this doesn't affect other projects. In the mid term this should improve the overall speed of locality scheduling and the handling of data files both on the server and client side. This changes is currently giving us most of the headache. I've read in an Italian site of BOINC.Italy that the Einstein server is going to be shutdown this weekend to allow an OS upgrade. Is this true? That's news to me. Not that I know of. Maybe some other project server, or maybe someone completely misunderstood my post of March 7 here in this thread.